We as a church are a community of believers who learn to follow Jesus together in the time that we live in. When the spirit was given to the congregation at Pentecost (Acts 2) what grew and formed were communities of believers who to this day walk together in love and carry forth the testimony of God’s love as revealed in Jesus into their city and the whole world. Christian life and discipleship is shaped through community. We wish to be a church that comprises all of life, where we learn to love God, each other and ourselves. We have a vision of a down-to-earth community that follows Jesus in our city. There are many things in a big city that seek to capture our hearts and minds. 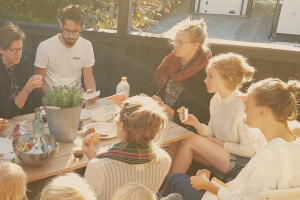 In a city like Gothenburg, it is crucial to have a community where we can be integrated into a strong ecosystem of relationships, groups and friendships that shape us to follow Jesus in our city. At CENTRO we wish to embrace community through small groups and through what we call Communities. Our Community-leaders work to create meeting places outside of the worship service where we can grow in relationship, fellowship and closeness to one another.